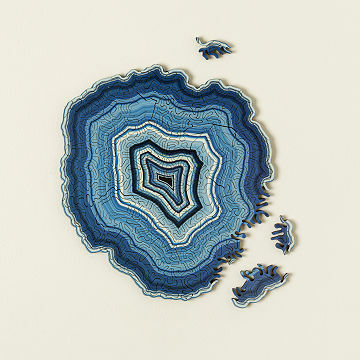 These stunning, cutting-edge geode puzzles seduce the eyes while challenging the brain. Beautiful—and fiendishly difficult—these cutting-edge geode puzzles seduce the eyes while challenging the brain. And like real agate, each of these designs (pink, blue, or multi-colored) has a distinct shape, color, and pattern. The way they're made is inspired by how a geode's crystalline structure is created in nature: a special simulation program develops an image by layering color that radiates from the puzzle's edge; an algorithm generates the puzzle piece patterns; and a computer-guided laser cutter shapes the pieces from birch plywood. We apologize in advance for bending your mind. Made in Somerville, Massachusetts. When pieces are aligned correctly, they slide together smoothly. Do not force pieces. Store in a dry place. This was a gift. The colors match our dinner ware. My wife hung them framed in our dining room. The detailed pieces are thick and sturdy. This'll be a beautiful puzzle worth framing (assuming my parents can get it together!). My dad has assembled this puzzle several times and enjoys it every time. The high quality laser cut wood provides a satisfying feel. Dad is a puzzle grandmaster, so it only took him about 30 minutes to finish the puzzle, but he enjoyed it very much. This was both a gift and self indulgence as they are so gorgeous. The quality of this is pristine. The colors are gorgeous. The puzzle itself is intense with the quirky projectiles, but a puzzle lover will adore this!! We bought this as a gift but don't tell we couldn't resist putting the puzzle together the night we received it!! It is small but so impressive and addictive to work on. Good Luck to all! Much better time spent than watching tv for the night! I sent this at Christmas and my mom did the puzzle at once. She told me, since then she gets it out whenever she has company because 1- It is beautiful, 2- It is something everyone is impressed with and wants to touch 3- everyone can enjoy it together. I sent this to my mom for her birthday. She's a a math whiz and gamer, not to mention a retired geologist with geodes scattered around her house But I think I underestimated the complexity of this puzzle. The pieces are so small, and so similar, she felt overwhelmed just dumping them out of the box. Then her arthritic hands had trouble grasping and moving the delicate pieces around. I think we'll try again (maybe after a glass of wine), but buyer beware that this might be a puzzle better suited for experienced puzzle masters who don't rely on classic puzzling strategies (there are none here) and who really need a challenge. I absolutely love the variations in shapes and the extra challenge that they provide over standard puzzle pieces. They piece are also very thick which makes for a fun tactile experience. The absence of straight edges also a layer of difficulty which is always appreciated. Not for the puzzle novice, but great for people who love puzzles and as a group activity! We don't have a lot of space for a big tabletop puzzle, but this one was a great size. Also, I really like the smell of lasercut wood. The color options were good and it's a creative idea.